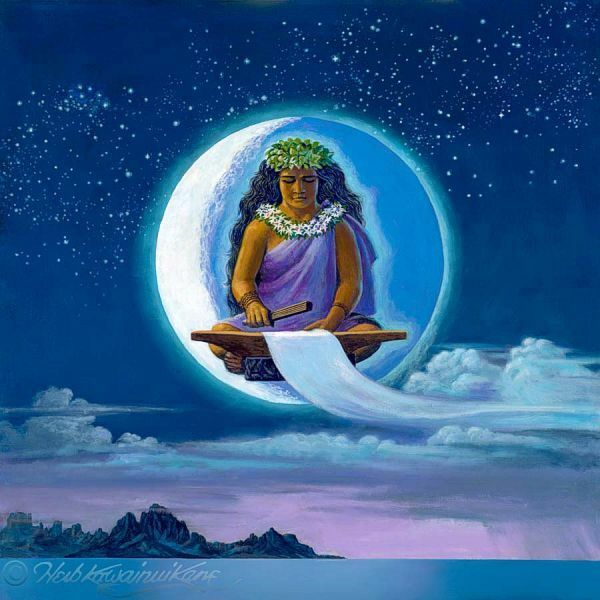 Characterized as the Mother of the Hawaiian people, Hina is an archetypal figure of the Polynesians, who traveled far and wide over land and sea, eventually going to live in the Moon. A multi-cultural legend, Hina is cherished by all Pacific Island peoples, and even exists in the Japanese culture as part of the name for Hina Matsuri, or “Girls’ Day”, as well as the central figure in a fairy tale about an ethereal girl who floats up into the night sky and disappears into the moonlight. She shows up in the most unexpected places: The famous Manga series “Love Hina” has its central romantic character named for her. She is primarily known as a goddess in Polynesian cultures, and is as revered in New Zealand, Samoa and Tahiti as well as in Hawaii. She is synonymous with beauty, creativity and productivity in all the places where her name is spoken. Hina is paired with a variety of male gods in the myth cycles of the Pacific Islands, typically with the proviso that when she left, it was to pursue her freedom, which some jealous and possessive mate had tried to limit. Always carrying her calabash full of stars and her emblematic crescent moon, she was liable to take off into the unknown the moment she thought her independence was at risk. As might be expected of someone who treasures their freedom so much, she hadn’t the heart to keep the stars and crescent moon imprisoned in the calabash. She allowed them to float free and take up their residence in the sky, to follow after them herself, and live in the moon she loved so dearly. Adventuresome tales are told of Hina, and as you travel across the sea, you can hear as many variations of her story as there are islands scattered across the Pacific. All of them emphasize her freedom-loving nature, her ingenuity and inventiveness, and her courage and persistence in the face of powerful opposition. Moonlight is referred to as “the brightness of Hina”. In Hawaii, she is frequently referred to as Hina of Hilo, and considered the patron Goddess of the Moon, of Artists, Chanting, Clouds, Rainbows and Creativity. She is especially associated with the Wailuku river on Maui, where it flows over high lava walls covering the mouth of a huge cave, to form the spectacular view of Rainbow Falls- with towering clouds that form over the mouth of the river as it enters the bay. She is credited with the invention of bark-cloth tapas and the colorful paintings that embellish them. She is also reputed to have created the rainbow as a way to climb up the vault of the sky and reach the moon, or as a veil to curtain her home in the cave below the falls. She, her most favored consorts, and her progeny were considered to be forces of good, influences of inspiration, invention and compassion, and enemies of oppression. Her exploits are recounted in many lyrically written tales as well as those traditional folk tales told in the islands. 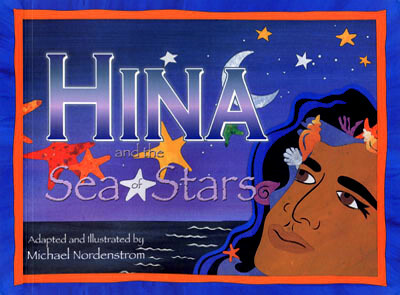 A few notable examples are: “Hina and the Sea of Stars” adapted from traditional folktales and illustrated by Michael Nordenstrom; “Legends of Maui” by W.D. Westerveldt, “The Legend of Te Maui”, by Richard Adams, and also “The Goddesses- Knowledge Cards” Text by Michael Babcock, Paintings by Susan Seddon Boulet, of which the “Hina” card- shown at the top of this page, inspired this post. Aloha, Hina! We rever your brightness, and revel in the beauty of the moonlight, the cloud and the rainbow. We celebrate your wisdom and courage each time we create something beautiful and useful, face our fears, or leave situations that oppress us. We endeavor to illuminate our lives with creativity and artistic vision, and to have compassion on our fellow beings, even as we seek our own personal freedom and fulfillment. 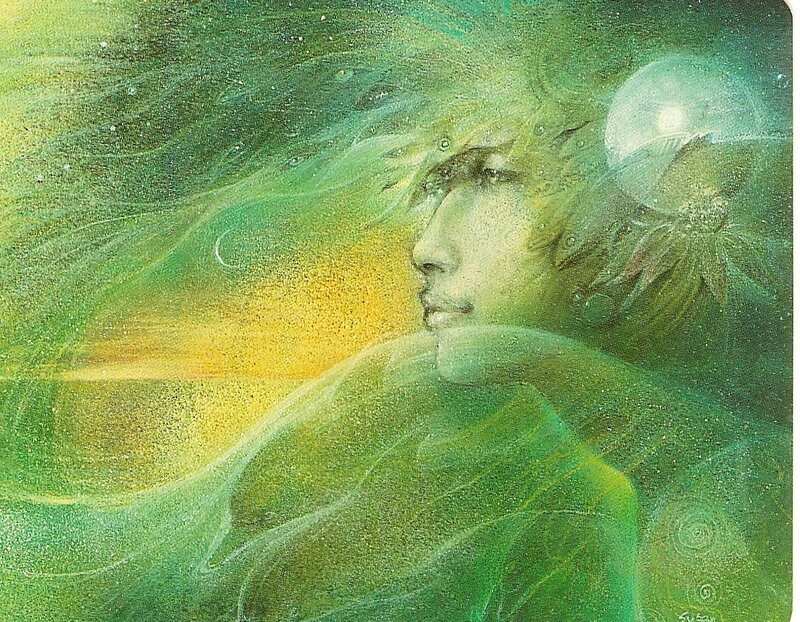 Many Thanks and Much Appreciation for the talent and efforts of the artists whose works have graced this article: Susan Seddon Boulet, Herb Kane, Michael Nordenstrom, and Paul Gauguin. As always, relevant comments and insights are welcome. 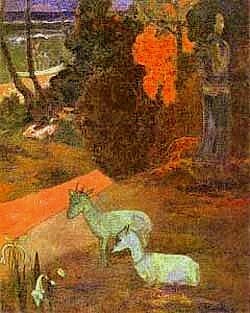 This entry was posted in archetypes, cartomancy, Creativity, differing interpretations, Divination, Goddess Knowledge Cards, Goddesses, Hawaiian Mythology, interpretation, Metaphysical, Moon, Moon Goddesses, Pacific Island Mythology, Polynesian Goddesses, Polynesian Mythology, readings, religion and spirituality, Romantic Interests, Spiritual, tarot, tarot instruction, tarotcircle and tagged Freedom Loving Feminine Archetypes, Goddess Knowledge Cards, Goddesses, Hawaiian Mythology, Herb Kawainui Kane, Hina, Moon Goddesses, Native Hawaiians, Pacific Island, Pacific Island Mythology, Polynesian Goddesses, Rainbow Falls, Susan Seddon Boulet, Woman in the Moon. Bookmark the permalink. I am writing for permission to utilize (as you did) a small jpg of “Hina” from Susan B’s Goddess Knowledge Card collection as one of the photos in a slide show accompanying my article, soon to be published at Examiner.com. We are promoting a healing drumming circle that involves Ancient Hawaii, hana and ho’oponopono utilizing dance and chants. You can see my column and browse the other articles if you’d like. I cannot pay you, because I don’t get paid – but I will give you and Susan credit for the photo and use the name you have given it. Thank you for your courtesy in considering my request.